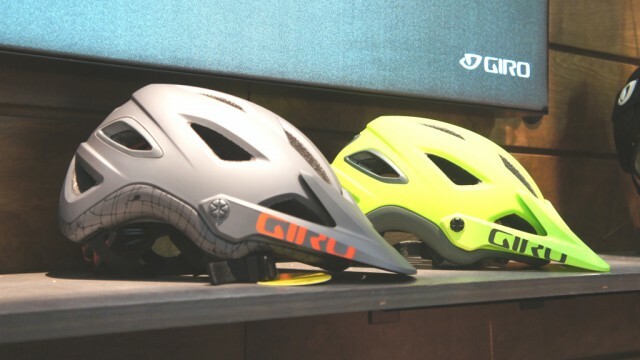 While they’ve been synonymous with high-performance helmets for a number of years now, Giro has steadily been broadening its range- first with shoes and more recently with apparel. 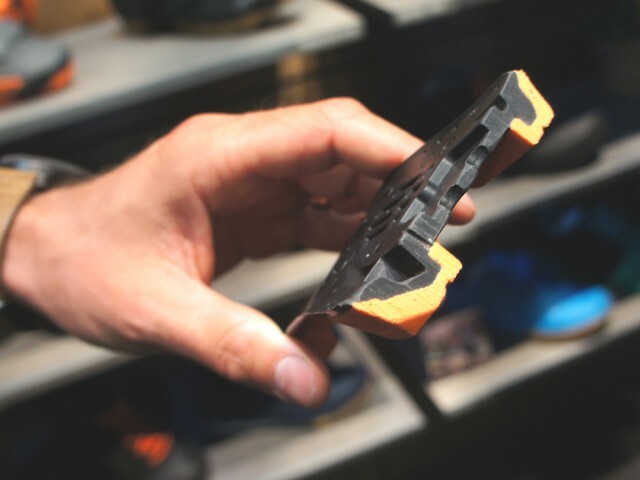 For a company whose experience until recently lay almost completely with noggins and styrofoam, the Santa Cruz company has proven remarkably good at outfitting the rest of the rider. 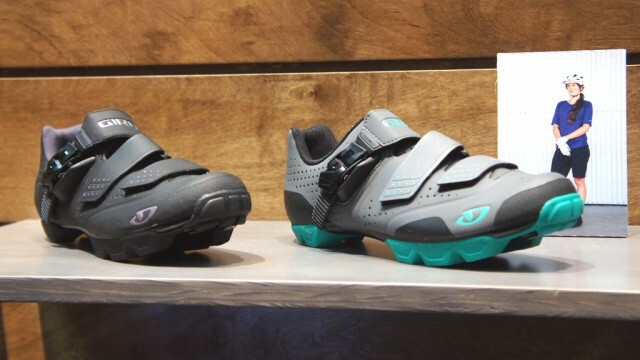 Of those we saw at Interbike this week, it’s the new (men’s and women’s) Privateer R and Manta R shoes that seemed likliest be a stealth success. Priced at $150, the Rs are an update to the excellent Privateer (reviewed here). Where the originals provided a great combination of stiffness, durability, and value, their Achilles’ Heel was a potentially deadly hard tread. 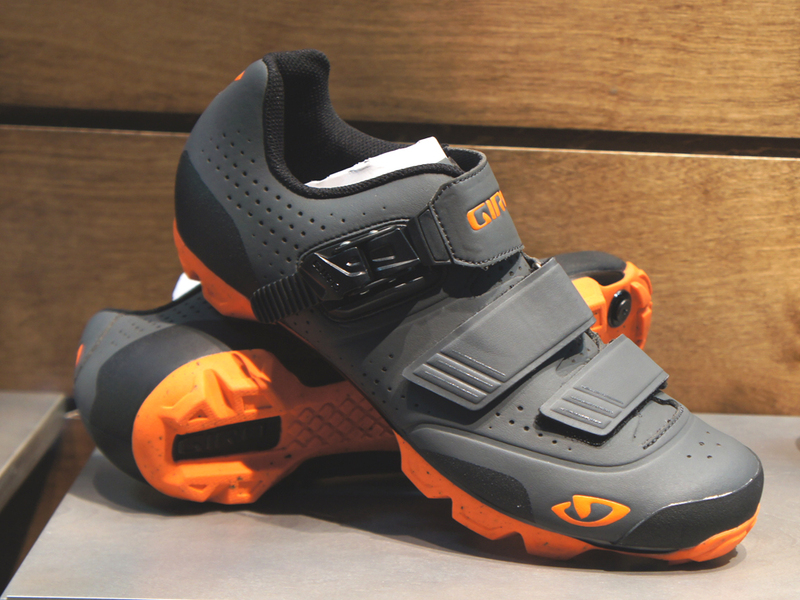 By adding co-moulded rubber to the shoes’ lugs, Giro has made an entry-level shoe that should leave riders little reason to look further up the range. 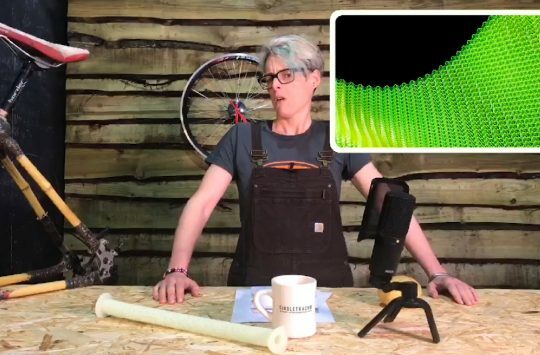 For good measure, forefoot and heel abrasion resistance was also improved- this is the sort of reasonably-priced performance product that we get pretty excited about. It’s a small step- but could be a good one. With the Truant range, Giro has also introduced their first mountain bike specific kit. 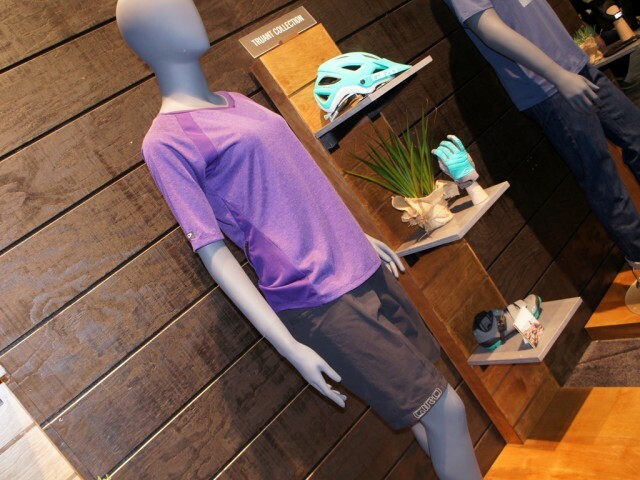 It’s a small range to start, with one pair of baggies and one jersey for each ladies and men, but if their urbane New Road pieces are any indication it will be well thought-out and quite comfortable. Only now with shorts that reach the knees. The Montaro/Montara duo was also on display. A trail helmet engineered from the start for class-leading ventilation, the Montaro was also built with the MIPS anti-rotation system in mind. A RocLoc Air retention system provides space for on-scalp air movement, aided by deep internal channels. 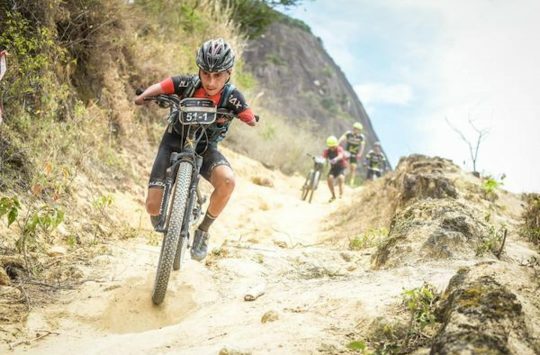 The super-absorbent brow pad holds ten times as much sweat as typical helmets’, making the rider feel cooler still. 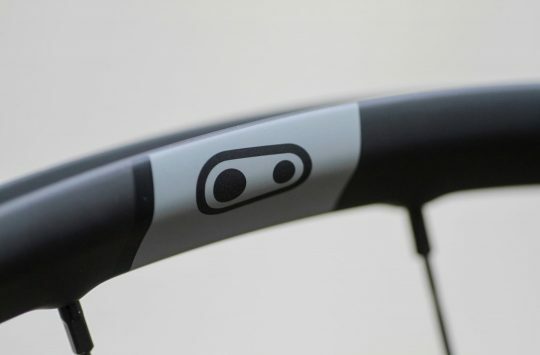 Vents in the goggle groove are rimmed with a clever grippy material, helping to keep straps in place, if you’re so inclined. The Terraduro is now available in blue. Because awesome. 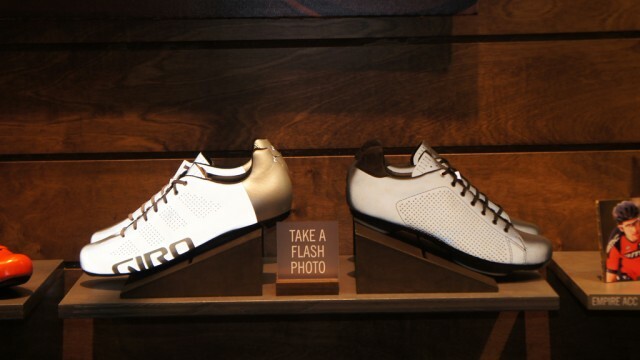 The Jimbo Phillips Jacket is the second in Giro’s “Reserve Shoe Program,” in which the company works with athletes and artists to create limited editions of shoes that they want to build (but which might not sell well enough to warrant a full production run). The Jackets shown here are the result of a collaboration with renowned skate and surf artist Jimbo Phillips. The edition is limited to 250 pair, so don’t dawdle. In a sign of things to come, the Silo is an urban helmet built of expanded polylactic acid (E-PLA). 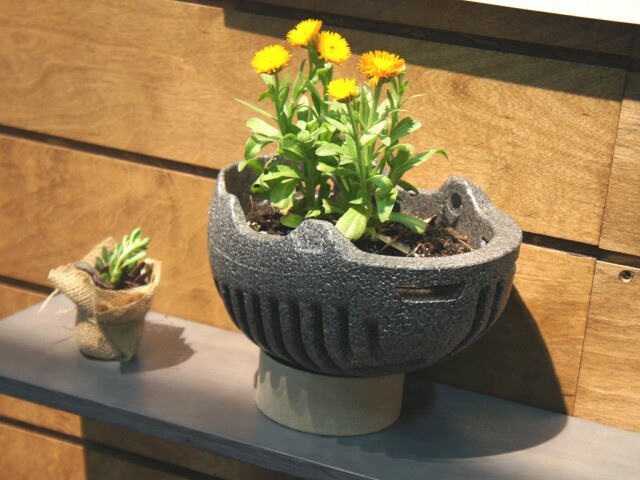 Where the more common EPS, which may or may not ever break down naturally, at the end of its useful life the Silo’s foam liner can be removed from its shell and straps and composted in the garden. The balance of the parts can then be recycled. 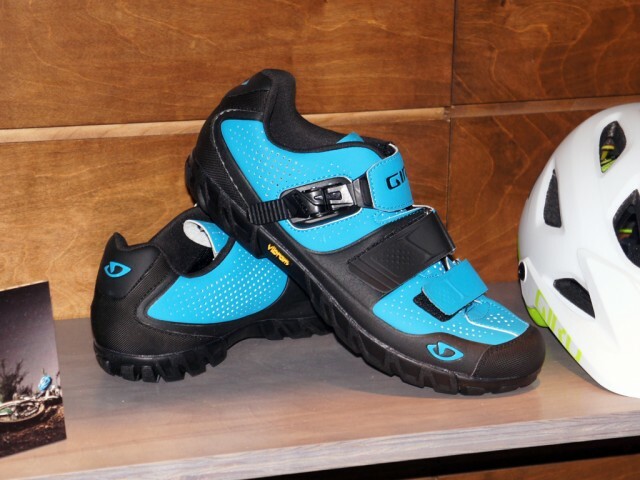 It’s a neat first step and shows that Giro is thinking about the downstream impact of their products. We will take a flash photo- but only because we wanted to. Finally we have the Reflective Empire ACC. It’s a road shoe, but the microfiber’s permanent reflective coating is pretty cool- because no one likes being hit by a car. It's not about the bike. No really.